Abstract: A curious look at biological photonic systems reveals a myriad of versatile approaches for the creation of multifunctional, hierarchically structured, dynamic bio-inspired materials. Here, we present a choice of materials that employ bio-inspired photonic architectures, implemented in soft, and fluid materials, with tunable and stimuli-responsive behavior. The first part of this presentation will be focused on elastic, mechano-sensitive, color-tunable bio-inspired photonic fibers, which mimic the photonic structures found in a tropical plant’s blue seed coat. The fibers consist of an elastomeric multilayer cladding, rolled onto a stretchable core. Their reflection color can be tuned reversibly by applying an axial strain or a lateral compression. This effect persists even after several thousand deformation cycles. Potential applications for mechano-responsive, color-tunable photonic fibers include the optical sensing of mechanical deformations and stress distributions in medical and civil engineering applications, solvent vapor analyzers, dynamic textiles, and components for fiber-optic signal processing. In the second part, we explore the use of emulsions for the creation of liquid compound micro-lenses with dynamically tunable focal lengths, inspired by the architectures found in the retina of nocturnal animals. We employ bi-phase emulsion droplets in responsive micro-lenses that can be reconfigured to focus or scatter light, and to form images. We provide evidence of the micro-lenses’ functionality for two potential applications – integral micro-scale imaging devices and light field display technology – thereby demonstrating both the fundamental characteristics and the promising opportunities for fluid-based dynamic refractive micro-scale compound lenses. 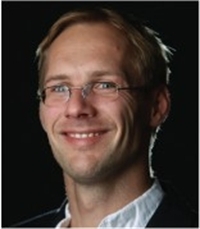 Biography: Mathias’ research focuses on unique optical sensing, communication and energy conversion mechanisms in nature and the development of bio-inspired, adaptive and actively tunable micro-optical devices. Through experimentation and optical modeling, and by employing a diversity of manufacturing principles, his group is developing novel optical technologies. He joined the faculty of MIT as an Assistant Professor in 2013. Prior to that, Mathias held a Feodor Lynen research fellowship of the Alexander von Humboldt - Foundation for postdoctoral studies at the School of Engineering and Applied Sciences of Harvard University, where his research was focused on bio-inspired photonics, bio-imaging and optical spectroscopy. He earned his degree in physics from the Saarland University in Germany and the University of Lorraine (formerly Henri Poincaré University) in France in 2006. Mathias then continued his graduate studies at the University of Cambridge in the UK at the Cavendish Laboratories, where he received his Ph.D. in 2010.